Summer days can bring on relentless heat making it hard to keep your lawn looking green and healthy. It can be even more difficult when you look around and see neighbors’ grass looking ever so green. Is it the grass, is it the treatment, is it just luck? In this article we’re going to share some things you can do to make your lawn the envy of the neighborhood and you won’t need any luck to do it. 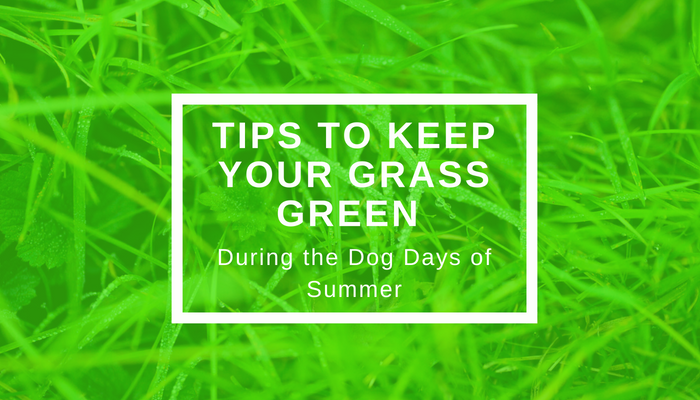 Use these tips to ensure your grass stays green even during the dog days of Summer. A good mowing technique is one of the most important elements of a healthy lawn. First things first. Don’t cut your grass too short. We recommend setting your lawn mower at one of the high settings for long grass. Long grass allows for longer roots which allow them to reach further down in the soil for moisture. Additionally, your mowing times can be a factor. You should aim to mow in the mornings before the hottest point of the day. Alternatively, if you mow in the afternoons you could risk burning your lawn. The combination of heat from the sun and from the mowing action could scorch the grass. During the heat of Summer, you can go weeks without rainfall. This can lead to dormancy, meaning your grass shuts itself down in order to conserve water and energy. Dormancy can lead to your lawn looking brown and scorched. However, you can create a virtual rainfall by watering. It’s best to mimic a real rainfall with your watering techniques by watering infrequently and deeply. This type of pattern is good for your grass because it encourages the roots to grow long and deeper which encourages healthy growth. As with any living thing, grass needs nutrients to survive and look healthy. Feed your lawn regularly with grass food. With regular feeding, your lawn can grow much thicker which doesn’t leave much room for weeds to grow. A thick lawn also helps to cool the soil, an added benefit to help your lawn beat the heat. Understanding your lawn’s unique needs can take you a long way in terms of having a healthy lawn. A PH test can help you determine the best course of action for lawn care. Purchase a soil test kit to understand your soil’s pH levels. You don’t want your lawn to be too high on the pH scale. If it is, that means that your soil is too alkaline. If your soil tests really low on the pH scale, this means that your soil is too acidic. You can balance the pH levels of your grass by adding sulfur to lower the pH or adding lime to raise the pH. Whether you are a long time veteran or a newbie, these lawn care tips can work for you. Knowledge is power and with a little time, you can start seeing greener lawn days before you know it. No Replies to "TIPS To Keep Your Grass Green During The Dog Days of Summer"